Amigos de Jesús In Texas! What a fabulous and fast few days with Father Pato and Alan Turner visiting us here in Katy, Houston and Brookshire, Texas!! They arrived on Thursday and after dinner with the Turner family, Janet Montgomery and Pat and Gerard St. Martin celebrated Mass in the Turner home. A great start to what has been a wonderful six days. Friday was a full day. Father Pato was the homilist and concelebrated Mass at John Paul II Catholic School. Their 6th grade teacher was Alan’s teacher over 20 years ago. She has an annual bake sale with her 6th graders each year to sponsor 4 children at Amigos. After Mass, the 6th, 7th and 8th graders all got to hear a wonderful talk about Amigos from Father Pato and Alan. They were riveted. Teachers were as well. Father Pato and Alan also spoke to all the 1st and 3rd grade classes after the “big” talk. 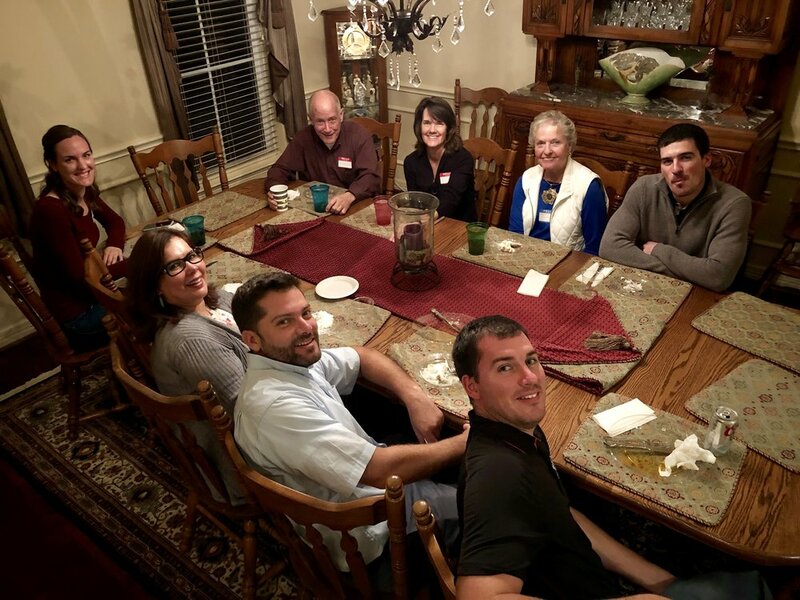 The evening was topped off with a dinner with current sponsors at Janet’s home. The sponsors got to hear firsthand what “their” child is doing and see many pictures of him or her. A wonderful evening! On Saturday, Father Pato concelebrated the evening Mass at St. John Vianney. After Mass there was a light dinner served while he and Alan spoke to a group of 50 people about Amigos de Jesús. Again, a riveted audience. Many good connections were made as well as the people were very interested in and supportive of Amigos de Jesús. Sunday began with Mass at St. Bartholomew in Katy. Father Pato was the celebrant and ironically, many of the 6th graders from John Paul 2 were there and were delighted to see him again! Following Mass, we had an afternoon at an amazing place called the Cotton Gin in Brookshire —many thanks to Janet & Kim Montgomery for making this a possibility. There were about 70 people who were able to learn more about Amigos and also visit personally with both Father Pato and Alan. Again, a lot of new connections and a very supportive audience! They left here and went to the evening (Spanish) Mass at St. John Vianney where Father Pato was the celebrant and homilist. The people were in awe of him—not only because he’s an amazing homilist, but because of the care and love that comes through just being by him. It took them almost an hour after Mass was over to leave as the crowd wanted to talk with him and hear more and support our beautiful Amigos de Jesús.... Again, lots of new connections to our Amigos family. Monday was a mini retreat at St. John Vianney following the 9:00 morning Mass. There were about 45-50 people who were very inspired by Pato’s teaching. They got to be tourists for a bit after the retreat and visit NASA with Savanah (recent volunteer now living in Houston). A small dinner at Alan’s grandma’s house topped off a wonderful day. Tuesday was another busy day...They came to visit me at work at St John Vianney and met a lot of the people who work there. They visited Joseph’s Coat thrift shop. This group collects jeans and Easter dresses for us on a regular basis. They spent the morning at St. John Vianney then got to meet Pat and her “Team E” downtown at her office. Together this group sponsors a child and has fundraisers in the office to add to our “pizza money” for our trips to Amigos de Jesús. They spent the evening at St. Bartholomew’s with Janet’s CCE class of junior high kids. Wednesday brought some much needed rest for all of us! The day was relaxing with lunch with Alan’s mom (me! ), sister and kids and his grandma. The kids call Father Pato either “Mr. Pato” or “Uncle Pato” and loved having these two and their undivided attention. Several games of ping pong followed as well as some shopping, running and laundry. Evening brought them back to St. John Vianney for a talk with the CCE students there... EVERYONE who has heard these two and the stories they share has been amazed, impressed and supportive of the good being done at Amigos de Jesús! There are a lot of new “family members” for Amigos here in Katy, Houston and Brookshire after these wonderful few days! Thursday—early; 5 am—takes them to Philly.... But, we want them back!!!! !